One of the best things about our custom shade sails is their versatility. All our shade sails are custom designed for your requirements and to fit in your unique space. We have fabric options that include waterproof as well as UV protection, and our extensive colour range allows you to choose a colour that will blend well with virtually any environment or building. Your home is likely your biggest asset. Most people want their home to be a place where they can relax, retreat, and enjoy time with family and friends. 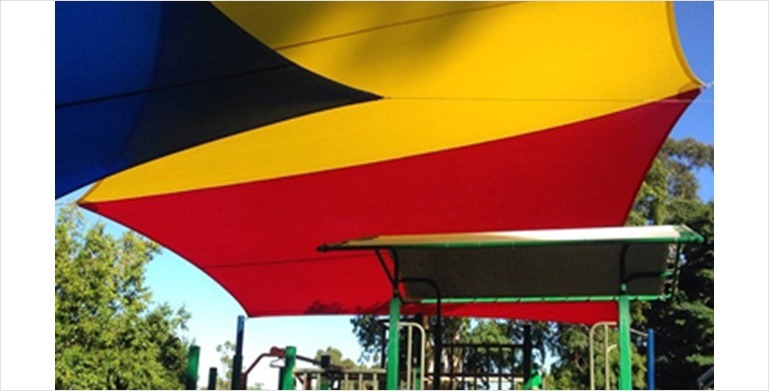 Shade sails are a perfect way to make the most out of the beautiful Gold Coast outdoors as they offer protection against the sun’s harmful U.V. rays and are also available in a 100% water resistant waterproof PVC fabric. Because we custom design our shade sails, we can give them the ‘look’ you want that will blend perfectly with your home and its surrounds. Our fabric choice and colour range will allow you to create your own unique design that you and your family will be able to enjoy for many years to come. Shade sails can a lot more to your home than just shade. They can also add value, character, and enhance the look of your home. Commercial shade sails often need to be congruent with other branding such as signage and lighting. We are experienced in working with all types of commercial clients from small business owners to schools and even our famous theme parks. Our shade installations and shade sails are all uniquely designed and installed using only the best available fabrics, materials, and equipment. Since we began in 1996, we have worked with cafés, clubs, pubs, restaurants, retailers, schools, kindergartens, councils, and theme parks. Our design, manufacturing, and installation doesn’t stop at shade sails. We are also a one-stop-shop for shade umbrellas and canopies.